Any industry that engages in pressure washing applications can benefit from commercial vinyl curtains. Unlike the decorative home interior counterparts, these are designed to contain water spray to a specific area. Typical applications in which they are useful include washing down cars, trucks, equipment, and shop floors. 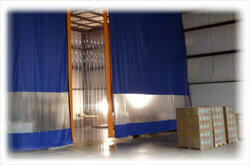 Since they withstand high water pressure, vinyl industrial curtains are ideal for creating individual wash bays. They can be set up anywhere inside of a shop, eliminating the need for brick and mortar type construction. Also great for outdoor use, the material is impervious to bad weather. Vinyl curtains can be purchased individually or in sets, depending on the intended use. Additional features are frequently available, adding to the professional appearance. That can make a big difference if customers can see the work area. People often pass judgment about the quality of the work based on how a facility looks. The material is naturally fire retardant and can be customized with business logo. There is a multitude of color choices. Available in multiple sizes, the opportunity for configuring a space is almost limitless. Many makers will custom cut panels to the client's specifications. Most installations call for the vinyl curtains to ride along a galvanized steel track. It can be directly mounted to the wall or ceiling, or suspended from a chain or cable. This allows the walls to be opened and closed easily. Magnetic closures are a popular feature, as it eliminates the need to re-secure the vinyl curtains each time someone passes through. The addition of clear sealed windowpanes serves two purposes. The first is that it permits viewing inside of the area, without letting water escape. Perhaps more importantly, because they extend from the floor to the ceiling, the curtains can block light. Windows allow a lot of natural light into the area. This improves visibility and eliminates the need for secondary lighting fixtures. Vinyl curtains increase workplace safety. High-pressure water sprays can produce a mist that contains chemicals from various cleaning agents. If operating a unit indoors, the aerosol can drift throughout the building. Combined with a ventilation system, the system contains indoor contaminants to the work area. They work so well for this that some equipment manufacturers use them to create paint booths. Another incentive is that there is virtually no maintenance. Heavy-duty vinyl will last for years. Paint and other substances hose off the surface with ease. Detergents will not damage them. Other materials, such as canvas, will start to show wear after just a few uses. It also cuts labor costs for clean up by as much as 40 percent. That means less time has to be devoted to the process, which makes a business more productive. Vinyl Curtains are a smart investment for businesses that use power washers in indoor and outdoor environments. They keep messes contained to designated areas and facilitate faster cleanup. It lends a crisp professional appearance to otherwise utilitarian spaces. Ideal for commercial and industrial applications, it is an affordable way to use existing floor space. Try out powerful hydraulic pressure washers, tackle any job! Remove oils, grease and dirt with ease using a hot water pressure washer.